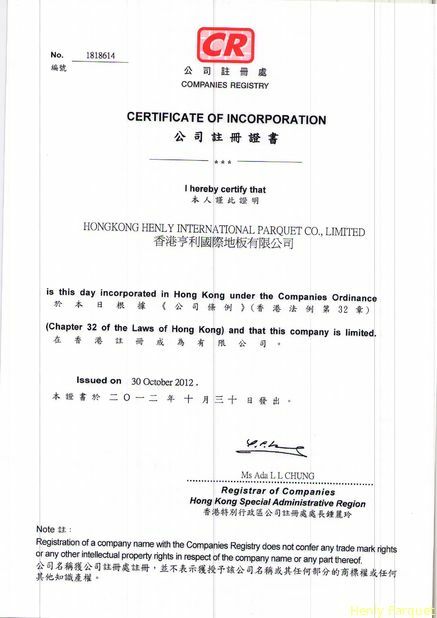 Hong Kong Henly International Parquet Com., ltd was built up in Oct 30th .2012. Trading meaning, we can do the business of sales and buy. So we can help Customer to do many fields of Construction, setting example wood flooring, Door, Sofa, Tile, Window or others. We also can help Inspecting the goods and reach request, no matter the Qty problem. No matter one room or projects. 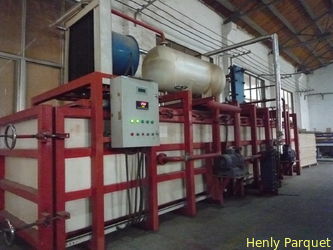 Production meaning, we have the processing factory, and all materials are bought by Henly Parquet. And all productions are request as Henly parquet standard. And we have person to Catch up each step in Production. 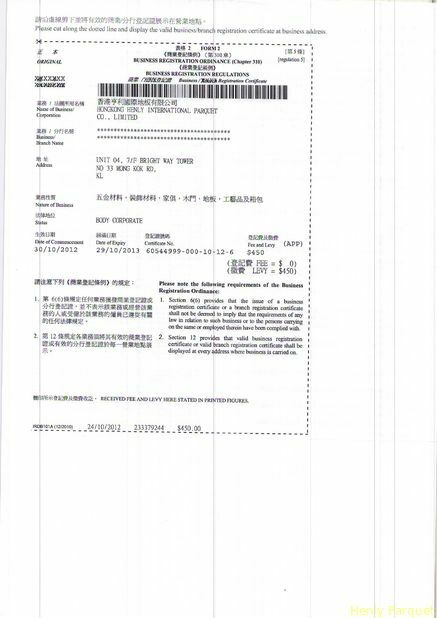 We have Business Chain in Huzhou Zhejiang, where are woods business Base of China. 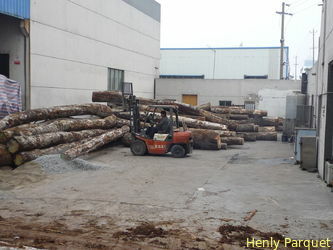 Now we can related our Purchasing field, we imported the Logs from Brazil, Europe, and Russion, then Process the materials into what we need. And although we are a new company, but we have good experience of flooring, and good sources of materials, so best price is not problem, and now we prepare best service and quality, then we can reach the Aim. Henly Parquet is not one company, we have cooperated company, and we discover each advantage , then Combine them Together, pay attention each steps, we can reach customers request, and we will also get. Henly Parquet. “Take Green In Arm ,Take Nature To Home”, give your best Home Environment. 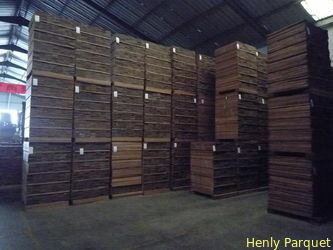 HongKong Henly International Parquet Com., Limited is a group company, which combine 3 company's together. Jinagsu Wanli, my old company, which make acacia flooring for proffessional from Logs to finished products. mufacturing the flooring for 7 years. Tianlong wood, which is for solid flooring .who also have his own sawn workroom, and starting the flooring species are taun and okan, now make effort of oak , so we work toegther. 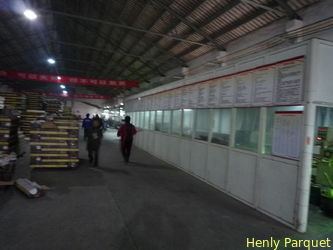 Guangda wood ,which is make the engineered flooring, who have good machines, and makeing the flooring for 13 years, now enlarge the factory, each month for 100000 sqm, and also have plywood factory. these factory are good friends and good business partner, why say this? now the world are sighting at the saving source, and combine term working, and cooperation, then we use these together, we will do well. As Amstrong, Nature-flooring, Homedepot, who all have no factories, but they have good term working, they use the best sources, so they do big and well. we are having the same dream. Everyday is new, looking back, and thinking tomorrow, we can do, can you give me Five. Henly lee , General Manager , woaking for the wood flooring for 7 years.,and know the relations between clients,and good experience of export, knowing the goods and finishing. good service. Partner A Feng , Jany , And Weeky. we are good friend, and good colleguer. they are good at the inspections and good view of color and style.